Hi, everyone! This week, I want to talk to you about a card that has some serious potential to do busted things. The card I'm talking about is Wilderness Reclamation. Being able to effectively double your mana production each turn can be incredibly powerful if your deck is built to take advantage of it. This week, I've got a few decks for you that do just that. Let's get started. When playing this deck, you'll want to remember that your life total is a resource and the only point of damage that matters is the one that takes you from one life to zero. It can often feel like you're on the verge of losing when playing a deck like this, but as with any control deck, you're waiting for that point of the game when you stabilize. Once that happens, you won't feel like you're balancing on the edge of a knife any longer, as you'll be the one in control. With this deck, your end game plan is to cast one or more copies of Wilderness Reclamation. Once that happens, you can cast a massive Explosion (from Expansion // Explosion) to deal a large amount of damage to the opponent. 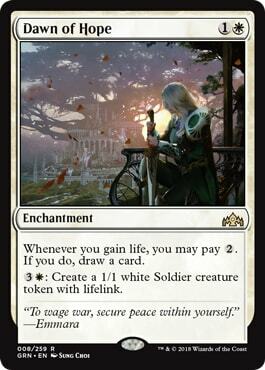 You can also make them draw a ton of cards as well, with the hope of decking them as an alternate win condition. By having multiple copies of Wilderness Reclamation in play, you can stack all of their triggers and tap your lands for mana in between each trigger resolution. While this can be time consuming to do on Magic Arena, at your local Friday Night Magic it shouldn't be so bad to perform. Alternatively, if you can't win via Expansion // Explosion, this deck has an alternate way to victory. Niv-Mizzet, Parun can ping your opponent to their imminent demise one point of damage at a time as you draw cards. Since Opt, Growth Spiral, and Chemister's Insight all allow you to draw additional cards, those Niv-Mizzet pings can really add up. 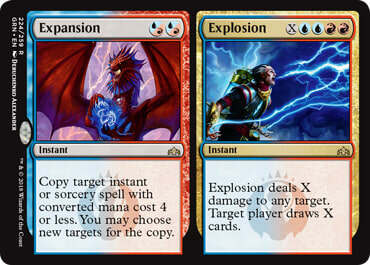 Plus, for those instances where you can't defeat your opponent with Expansion // Explosion alone, by adding in Niv-Mizzet, Parun you are able to deal the damage from Explosion to your opponent and then target yourself as the player to draw additional cards, effectively doubling the Explosion damage. This deck is very similar to the Explosive Wilderness deck from above, except it doesn't use as much counter magic. Instead, this deck uses the power of having Gates on the battlefield as a way to destroy an opponent's creatures. Gates Ablaze scales nicely as the game progresses allowing you to destroy multiple large creatures at once, something you might not be able to do without either having a board sweeper or multiple burn spells. Since this deck's creature of choice is Hydroid Krasis, it's quite possible for you to destroy all your opponent's creatures while leaving your Hydroid Krasis only slightly singed. In the end, this deck can win by either delivering a beating from above with Hydroid Krasis or by casting a large Explosion. While this deck might have similar win conditions as the previous deck, this deck can ramp up its mana production quite a bit faster thanks to Circuitous Route. While the Gates you can find with it might enter play tapped, they untap just the same as all of your other lands do at the beginning of your end step when you have a Wilderness Reclamation in play. I just wish there were more ways to use that mana on the opponent's turn. Simic Ascendancy is a card that allows your creatures to grow in size while also acting as an alternate win condition. It's a great card to have when playing against a Fog deck, since the combat damage your creatures will deal usually gets prevented. When you have Simic Ascendancy in play, not only do your threats get more and more threatening thanks to the +1/+1 counters Simic Ascendancy provides, but with each +1/+1 counter you create on a creature (no matter the source of that counter), you also get closer to winning the game on the spot during your next upkeep. Don't forget that Hydroid Krasis enters the battlefield with X +1/+1 counters on it, so it will also add counters to a Simic Ascendancy you have in play. This deck also has another mana sink in it, Dawn of Hope. With it, you can create a steady stream of creatures that can begin accumulating +1/+1 counters. They also act as a great way to chump block an attacking creature, as you'll stop the damage from the creature as well as gain a point of life (assuming the attacking creature doesn't have trample). With Dawn of Hope creating a 1/1 Soldier with lifelink every time it is activated and Wilderness Reclamation doubling the amount of activations you can perform, you can build up a large contingent of creatures in very little time. When those creatures get buffed by Ethereal Absolution or The Immortal Sun, you suddenly find yourself with a powerful force indeed. Plus, if you have a copy of Ajani's Welcome or two in play, the amount of life you can gain can make it tough for your opponent to attack you in a way that brings your life total down substantially. Oh, I almost didn't mention it, but this deck also plays four copies of Fountain of Renewal, which also adds to your life total each turn. With all of that life gain, you shouldn't have a problem reaching the point where your opponent is out of resources and you're sitting pretty with a few enchantments in play and mana to burn. Once this happens and you're fairly certain you can defend against almost anything, you can play Ill-Gotten Inheritance as a fun way to finish off an opponent without even trying. Wilderness Reclamation certainly has the potential to do things that feel totally busted. It can make games miserable for your opponent when it seems like you're always able to do something with your extra mana. Currently in Standard, it doesn't seem like there's anything you can do that's too over powered, but that could change once War of the Spark comes out. What do you think of these decks? Do you have any suggestions for improvements? Let me know by leaving a comment below or you can reply to me directly on Twitter (@mikelikesmtg), or email me directly at mikelikesmtg@gmail.com. And be sure to join me here again next week as I continue my search for innovative decks in Standard. I'll see you then!